Hello traders and crypto enthusiasts! As we approach the full launch of Beaxy Exchange I’d like to take a minute to define exactly what you will be able to do with BXY and how these features work — for anyone that has acquired or is considering acquiring BXY in the future. The information below is readily available on our website, whitepaper, and customer support portal but getting it all for you in one quick and easily digestible format is my top priority, so let’s get to it! 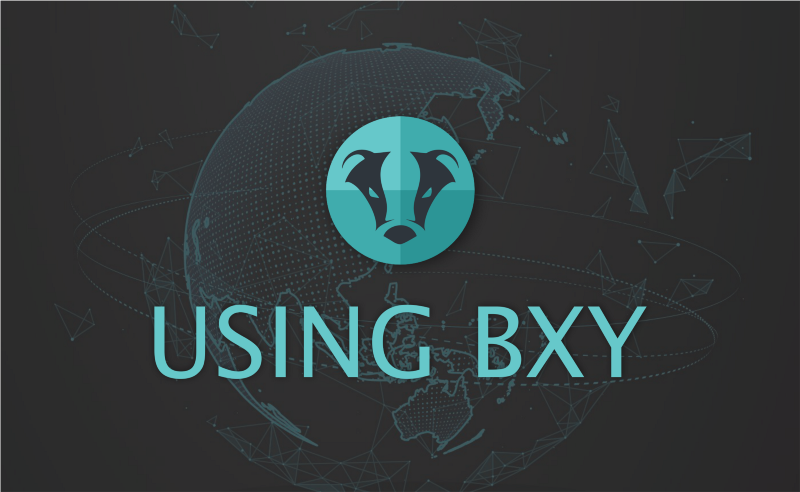 Ideally, we want to better educate traders on why holding/staking/locking and general use of the BXY token around Beaxy can provide users with a degree of functionality and opportunity that otherwise wouldn’t be available if aforementioned traders were to sell BXY for a quick buck. Now what if Beaxy’s native exchange token (BXY) can offer traders more value from holding and using rather than selling? This was the goal in mind when designing the initial utility of the token, as well as the inspiration for the additional features that will become available as we build the exchange out. So, I’ve got some BXY… What can I do? When using an exchange, a tiny portion of your final order is collected as a fee for using the platform. This is how all exchanges make money and is a fundamental component to any operational exchange. 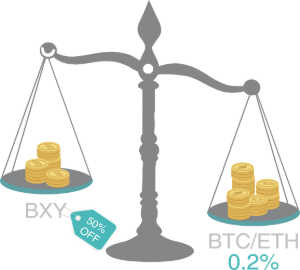 With Beaxy, you can pay these fees with your BXY balance, and at a 50% reduced rate! This means you will only need half as much BXY as you would BTC in order to pay your fees. Want to hang onto all the BTC that you possibly can during trades? This option is for you. The Staking Program is flexible in that you can use it independently or in conjunction with the above feature. Yes, you can save 50% on all trades by paying with BXY. But if use BXY to pay fees AND obtain the Diamond User Level (max tier) through the Staking Program you will now be looking at a 62.5% reduction in fees across all trades. Note: User Level tiers are determined by quantity of BXY, not the duration of the locking period. Beaxy has future plans to be a modular exchange. We want to use BXY to give users the opportunity to add unique features that will be obtainable directly through your exchange account. Examples of this are Custom SMS alerts, Premium TradingView charting, and in the future, access to Beaxy App Store purchases. A primary reason why Beaxy was created in the first place was to take the general feedback from what the community had at the time and use those ideas as the foundation to build an improved exchange. Although we’ve accomplished a lot since then, we still find community feedback to be one of the most valuable things when considering what to prioritize. We plan to remain open minded about feedback and routinely tap into the community to collect useful information on the best ways we can improve Beaxy and continue moving forward. Having any amount of BXY will get you rights to participate in all community polls and surveys that will most likely be conducted through our Discord channel. You may have seen some items from our “Swag Packs” circulating around the web — which were sent out as early promotional items — but don’t worry! You will be able to get your hands on some Beaxy swag as well. We plan to offer Beaxy branded merchandise that can be purchased with BXY directly from us. As the exchange continues to develop, we will remain open minded about additional ways we can utilize the BXY token to provide added value to your BXY tokens. This option is only for qualified account holders in approved jurisdictions, as the Loyalty Program is not accessible in jurisdictions that are considered to have any sort of regulatory uncertainty. The supply of the PLUS token will be equal to that of the BXY Token, however, the PLUS token will only be available through the Beaxy platform. The Beaxy Token (BXY) can be exchanged for the PLUS Token at a 1:1 rate, and will remain locked in as PLUS tokens for a period of time, set by the user. This program is designed to reward those who are holding PLS on the Beaxy Exchange. 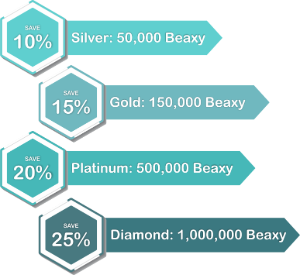 Holders will receive a proportionate share of up to 25% of the monthly transaction fees collected by the Beaxy Exchange according to the number of PLS tokens held. Receiving a proportional share of loyalty rewards means what you collect through the Loyalty Program will be impacted by how many PLS tokens you have locked relative to how many PLS tokens others have locked. Users must complete KYC verification in order to be eligible for loyalty bonuses and permission will be dependent upon the regulations governing their jurisdiction. Payouts for loyalty rewards are done on a monthly basis, which means on the first of each month all PLS holders will receive loyalty rewards for the previous month. Reward payments will happen on a monthly basis, whereas reward calculations are performed on a daily basis at midnight UTC. Let's say you lock 100K BXY tokens for 6 months, which means you will receive 100K PLS tokens. Let's also assume there are 10 million locked BXY tokens across all accounts on Beaxy, so there will be 10 million PLS tokens in circulation. Given this data, you will have 1% of all PLS tokens for that day. We then need to know the total amount of commission collected for that day as well. Let's say Beaxy collected $1 million in commission that day, to make this simple. The example above states that you have locked your BXY tokens for 6 months, so you will receive 25% of the $10,000. Your loyalty rewards payout for this day will be $2,500. You will see this balance on the Loyalty Rewards page as a "Pending Balance", and it will change every day after the midnight calculations are performed. On the first of each month, the Pending Balance will be credited to your account. Rewards will be paid out in every kind of crypto and fiat that we charge commission on. You will be able to see exactly what you earned in the loyalty rewards report that you can download from the same page for each month. You can see the summary in BTC and FIAT equivalent as well, for an easy understanding of how much you are making. For more information on how to download your monthly statement, see the article below. If you have any questions about the information above, don’t hesitate to reach out to a team member for clarification. And as always, thank you for your support! We look forward to having you trade with us!